Setting up for studies requires just the right desk to serve as a solid work space. 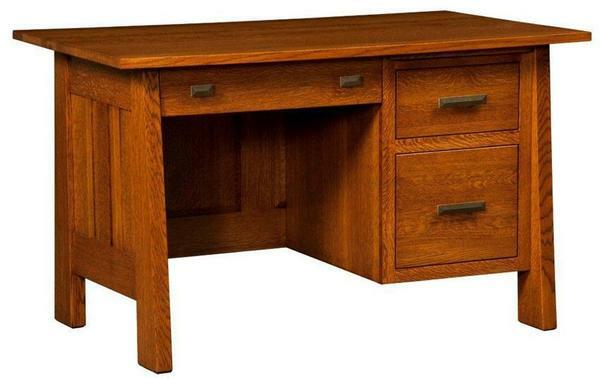 The Amish Furniture Freemont Mission Student Desk offers a recipe for success. This modest desk fits right in at a dorm room or small office space or up in your child's bedroom. Complete with one file drawer, one storage drawer and your choice of a central pencil drawer or keyboard pullout, all the ingredients for organized study are here. Simple mission style allows this wood desk to blend easily with different decor. The desk top is 1" thick and the drawers are top quality, with full extension drawer slides making room of the most space per drawer. The Freemont Mission Student Desk measures 52" wide, 30" deep and stands 31" high. Take a look at the Freemont Mission File Cabinet for added storage and organization. The Freemont is handcrafted by skilled Amish craftsmen and is built to last. Browse complete office furniture sets in different styles in our Shop the Look section. For assistance with any questions, please call an Amish Furniture Specialist today at 866-272-6773.